Not only did Sree put his foot down refusing to do the task but also lost his temper. 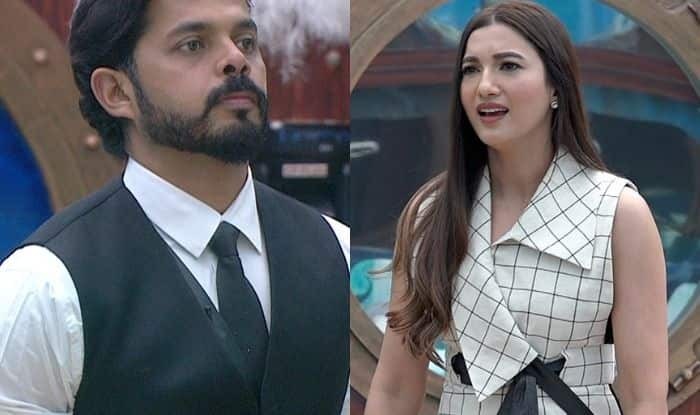 After leaving the Bigg Boss house yesterday actress Gauahar Khan took to Twitter to disapprove of Sreesanth‘s behaviour only to be slugged out by his wife for targetting the former cricketer. Gauahar was in the house as a celebrity guest and was seen handing out challenging tasks to the housemates four days before the finale, got into a row with Sreesanth when she asked him to persude Dipika to give up her husband Shoaib’s jacket and nikaah dupatta in the storeroom. Not only did Sree put his foot down refusing to do the task but also lost his temper. Referring to this incident, Gauahar tweeted, “Sadly despite all the nice things I think of Sree n all the support I have given him b4 I entered , his behaviour was extremely rude with me, refused to talk to me when I asked politely, said even if xyz was in my house I would behave the same way(took names of legends)” (sic). In an attempt to justify her husband’s decision, Bhuvneshwari tweeted, “Like Juhi ji said y’day consistency is very imp..and Sree is consistent in his feelings and bond wth Deepika ji. When he told bigboss he can’t ask Surabhi’s tissue for nomination. How can he ask Deepika ji for her Nikah Dupatta. It’s too personal stuff for any woman evn fr a task” (sic) but reading Gauhar’s tweet, Bhuvneshwari replied, “Hence you proved my point. Your intention is only to Malign him” (sic). This was just the start of the spat as in another tweet, Gauahar tagged Sreesanth’s wife and wrote, “N I just read that @Bhuvneshwarisr1 thinks that I went in with an intent to instigate him n make him look bad !Without even tagging me, but I’d like to tell u dear , that I said more than 2 times to him that he is doing well , n that I like his game ! Also now I’ll say the truth” (sic). Giving a more vivid explanation to the task that she had handed out, Gauahar tweeted, “Dipika , I’m sad that u don’t get to make ur own decisions,, I explained v well to Sree to give u an opportunity to shine, he instead thought it was a sacrifice , it’s a race to the finale, she would’ve got her things back in 3 days , intact ! #logic not rocket science !” (sic). The actress however, respected Sree’s game and empathised with his strategies as she tweeted, “I understand family is family but do not question someone’s intent who just when In as a guest ! N actually was v nice to someone despite the person being the only 1 extremely rude n abusive in my presence! Anyway I still maintain , he’s played a good game !” (sic). In today’s episode, ex Bigg Boss contestants Kamya Punjabi, Gautam Gulati and others will be seen entering the BB House in lieu of another task and the pre-cap gave a sneak-peek into the mid-week eviction which the contestants will have to face before they make it to the finale.